The High Altar on Sunday, September 16, 2018. Father Jim Pace was celebrant and preacher for the Solemn Mass on Sunday, September 16, 2018. Over the time I have served at Saint Mary's, I have learned more than I ever imagined I would need to learn about the maintenance and conservation of our building and its furnishings. Because of the age of our building and its landmark status, more and more work will need to be done by skilled artisans under the direction of architects and engineers who have experience with buildings like ours. Fortunately, we are in a great city where people with such training and experience are to be found. Working with the artwork, the decoration, and the furnishings of the altar has taught me many new things. But my education about church plate, that is, the vessels used in worship, began when I was rector in Michigan City, Indiana. A family there had commissioned William Frederick (1921–2012), a noted Chicago silversmith, to make a large silver bowl for Trinity Church's baptismal font. A simple design of unadorned arches around the rim of the bowl connected the very contemporary piece to the arches of the church and its cloister. Frederick had been commissioned to make a new mace for the American College of Surgeons (ACS). When it was finished, someone wanted him to apply new gold plating to the old one. He wouldn't do it—and it wasn't done. The leaders of the ACS were unaware, as I was before I met Mr. Frederick, that objects like that mace were far more valuable as they were than they would be with shiny, new gold plating. Over time, gold plating may look as if it has worn away. That can actually happen when people use polish on gold, which only needs soap and water and soft cloths for it to shine. Still, gold plate sometimes grows dull over time, when the gold plating is drawn into the sterling silver. One might think of our church home as "vermeil"—gilded silver or bronze—if you will. The extraordinary repainting of the church in 1997 seems to me to be very much, as it were, a washing with soap and water and a polishing with a very soft cloth—taking great care with great treasures and a historic building. We have many things that will continue to need care from people with training, knowledge, and experience. Again, we are in a city with resources. Saint Francis Altar Candlesticks designed by Robert Robbins Studio in 1946. The six candlesticks from that altar were still in use as extra candles on the high altar when I first came to Saint Mary's. We had to stop using them because they were so banged up. Last year, a grant from the New York Altar Guild, along with other gifts, enabled us to restore two of the six candlesticks. The All Souls' offering this year will be used to restore as many of the four as we can. In the June 1946 issue of the then-monthly parish magazine Ave, Father Grieg Taber, rector, described the altar and the candlesticks that were dedicated that year on Ascension Day. He wrote: "On the altar rest six carved wooden candlesticks in the renaissance style, covered with silver leaf. They are truly majestic both in design and style." The restored wooden candlesticks are now handled only by gloved hands. The carved wooden canopy for the Saint Francis Altar with the coat of arms of the Franciscans. On the right one can see one part of the altar, which was cut into two pieces. YOUR PRAYERS ARE ASKED FOR Audrey Jean, Irma, Al, Flor, Marge, Chandra, Milena, Greg, Alexandra, Carlyle, James, Karen, Eloise, Carlos, Susan, Marilouise, Ridhima, Lakshmi, Timothy, Barbara, Dennis, Robert, Abraham, Randy, Burton, Michael, Greta, May, Heidi, Takeem, David, and Sandy; for Horace, Gaylord, Louis, and Edgar, priests; and for all the benefactors and friends of this parish . . . GRANT THEM PEACE . . . September 23: 1874 Margaret Miller; 1938 Harris Dobb Baker; 1969 Rosie Matilda Flemister Erwin. THE ORDINARY FRIDAYS OF THE YEAR are observed by special acts of discipline and self-denial in commemoration of the Lord's crucifixion. Abstinence is not observed after the Eucharist on the Eve of Saint Michael and All Angels, Friday, September 28, 2018. Br. Damien Joseph SSF and cantor Elaine Lachica. The bas relief of the Crucifixion designed by Eugene Waterman Mason (1919–1999), newly restored by Sandra Spannan and her company "see. Painting. Inc."
THIS WEEK AT SAINT MARY'S . . . Sunday, September 23, The Eighteenth Sunday after Pentecost, Morning Prayer 8:30 AM, Mass 9:00 AM, Mass 10:00 AM, Solemn Mass 11:00 AM, Evening Prayer 5:00 PM. An opportunity for fellowship follows each of the Masses . . . Wednesday, September 26, Sung Mass 12:10 PM . . . Thursday, September 27, Mass and Healing Service 12:10 PM . . . Friday, September 28, Eve of Saint Michael and All Angels, Sung Mass 6:00 PM . . . Friday, September 28, 7:00 PM, Centering Prayer Group, Atrium, Parish Hall, Second Floor. Please note the group will meet at 7:00 PM this Friday only. AROUND THE PARISH . 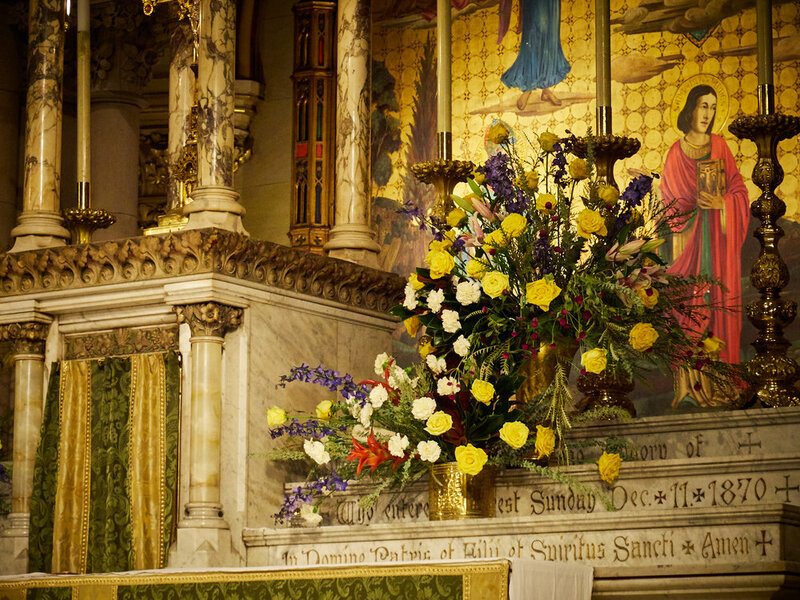 . . We still hope to receive donations for altar flowers on the following dates: October 14 and November 18 and 25. If you would like to make a donation, please contact the parish office . . . Friday, September 28, is the twentieth anniversary of the Reverend Alison Turner's ordination to the priesthood. We are very thankful for her ministry among us . . . Pledge to keep up with your pledge! During the summer months we sometimes experience cash-flow problems as many friends and members of the parish are away, taking much-needed vacations. We are grateful to all those who continue to support the mission and witness of this parish . . . Father Gerth will be away from the parish from Sunday afternoon until Wednesday evening to attend a Leadership in Ministry conference . . . Attendance: Holy Cross Day 86; Last Sunday 143. A FLOWER-GUILD EVENT . . . On Tuesday, October 16, 6:30–8:00 PM, celebrity florist Peter Krask and the members of the Saint Mary's Flower Guild will lead, and host, a Floral Design Class here at the parish. Those attending the class will create an autumnal flower arrangement to take home that is suitable for the upcoming season! Mr. Krask, who often appears on NBC's Today Show, will demonstrate and teach how to select, prepare, and arrange flowers. Those of all skill levels, including beginners, are encouraged to attend: no prior floral design experience is necessary! All materials are provided and complimentary wine and cheese refreshments will be served. $85 admission with proceeds to benefit St. Mary's Homeless Outreach Ministry. Due to space constraints and the desire for all participants to receive individual attention and assistance, the size of the class is limited to 25 students. You can read more about Mr. Krask on his website. In order to reserve a space in the class, please contact Peter Ruane or call the parish office at 212-869-5830. Saint Elizabeth's Chapel was redesigned by architect Eugene Mason in 1923 to become the parish's mortuary chapel. The statue of Our Lady of Mercy is by Lee Lawrie (1877–1963). OUTREACH AT SAINT MARY'S . . . Donations and volunteers are needed for our next Drop-in Day on Wednesday, September 26, and for the many requests for assistance between Drop-in Days. We are in particular need of basic items such as the following: packs of new underwear in various sizes for both men and women; slacks for both men and women, including jeans, chinos, khakis, etc. ; packs of new socks, white and black; rainwear; knapsacks; and toiletry articles. Please contact Father Jay Smith if you would like to volunteer for this important ministry or if you would like to make a donation . . . We continue to receive nonperishable food items for our outreach partner, Saint Clement's Food Pantry. Please place those items in the basket near the ushers' table at the Forty-sixth Street entrance to the church. We are very grateful to all those who continue to support this ministry. FROM THE MUSIC DIRECTOR. . . The cantor at the Solemn Mass on Sunday is soprano Sharon Harms, a regular member of the Choir of Saint Mary's, who will sing Samuel Barber's "The Crucifixion" from Hermit Songs during the ministration of communion. Twice a winner of the Pulitzer Prize for music, Samuel Barber (1910–1981) remains one of the most revered twentieth-century American composers. His Hermit Songs, Opus 29, was premiered in 1953 at the Library of Congress, sung by soprano Leontyne Price, with the composer at the piano. Barber's Hermit Songs is a cycle of ten settings of anonymous poems written by Irish monks and scholars from the eighth to the thirteenth centuries. "The Crucifixion" is the fifth song of the cycle. The original text is from The Speckled Book (Leabhar Breac), a collection of Irish homilies dating from the twelfth century. The English translation which Barber set is by the noted literary critic, journalist, poet and scholar, Howard Mumford Jones (1892–1980). As the Great Thanksgiving begins. Servers are Julie Gillis (L), Leroy Sharer, Peter Ruane, and Ingrid Sletten. THE VISUAL ARTS AT SMV . . . There is an exhibition of new work by the painter Lola de Miguel in the Gallery in Saint Joseph's Hall. Lola, who was born in Spain, now lives in New York City. She has studied painting at the Art Students' League. This is her third show here at Saint Mary's. Her work-the current exhibit is called "The Jungle"-is always marked by vivid colors and arresting images. The pictures at first seem abstract. However, when one looks more closely, images of flowers, vegetation, birds, and other animals begin to emerge. They invite a careful and contemplative gaze . . . On Saturday, September 29, at 6:00 PM, an exhibit entitled "Spirit's Flight" opens in the Gallery in Saint Joseph's Hall. This exhibition features the work of two artists, Deborah Holcombe and parishioner Ingrid Sletten. Ingrid and Deborah's work, in different ways, explores the intersection between nature and the spirit. They have subtitled the exhibition "More Than the Eyes See: Combining Science with Revelation." An Artists' Talk for this exhibition will take place on Thursday, October 18, 6:00-8:00 PM. The Saint Francis Altar in Saint Joseph's Hall. LOOKING AHEAD . . . Friday, September 28, Eve of Saint Michael and All Angels, Sung Mass 6:00 PM . . . Saturday, September 29, Saint Michael and All Angels, Noonday Prayer 12:00 PM, Mass 12:10 PM . . . Wednesday, October 3, Eve of Saint Francis Day, Transitus Service 6:30 PM in the Lady Chapel . . . Thursday, October 4, Saint Francis of Assisi, Solemn Mass 6:00 PM . . . Thursday, October 4-Friday, October 5, Annual Conference of the Society of Catholic Priests. Presentations for members of the Society. All liturgies are open to the public. ACADEMIC YEAR SCHEDULE begins on Sunday, October 7, The Twentieth Sunday after Pentecost. The academic-year worship schedule begins: Sung Matins 8:30 AM, Mass 9:00 AM, 10:00 AM, Solemn Mass 11:00 AM, Solemn Evensong & Benediction 5:00 PM. The parish choir will sing at all Solemn Masses through the Feast of the Body and Blood of Christ: Corpus Christi, on Sunday, June 23, 2019. AT THE MUSEUMS . . . At the New-York Historical Society, Central Park West and Seventy-seventh Street, "Harry Potter: A History of Magic." October 5, 2018-January 27, 2019. From the museum website, "Capturing the traditions of folklore and magic at the heart of the Harry Potter stories, Harry Potter: A History of Magic, a British Library exhibition, combines century-old treasures including rare books, manuscripts, and magical objects from the collections of the British Library and New-York Historical Society-with original material from Harry Potter publisher Scholastic and J.K. Rowling's own archives. From medieval descriptions of dragons and griffins to the origins of the sorcerer's stone, visitors will explore the subjects studied at Hogwarts and see original drafts and drawings by J. K. Rowling as well as Harry Potter illustrator Jim Kay.